Blessed with the instincts of an animal in addition to his rapid healing, Wolverine uses his keen senses to detect an imposter. 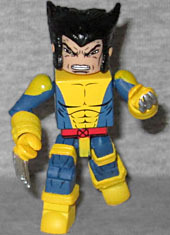 It's weird, considering how popular Wolverine is, that this is the first time there's ever been a Minimate of him! Introduced in Incredible Hulk #180, this Canadian special agent eventually joined the X-Men, yet he always remained a loner - it wasn't until 1991 that he began dressing like part of the team (a change instigated by artist Jim Lee and editor Bob Harris, who wanted to bring Uncanny X-Men back to its roots, after years of having random characters scattered all over the place). This blue-and-yellow uniform has the same straps that Jubilee's had, and the figure gets pointy black hair and his sharp adamantium claws. 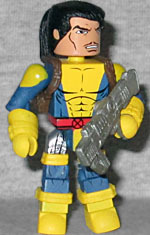 We look forward to seeing if Art Asylum ever makes more Wolverine Minimates in the future! Fred J. Dukes has been a circus performer, a super-villain and a government agent. His mutant power makes him super-strong, invulnerable to most weapons, and virtually immovable. To really do Blob justice in Minimate form, you'd have to give him an all-new body, like this custom. But that was never going to happen, so for something made entirely of pre-existing pieces, this is really good! 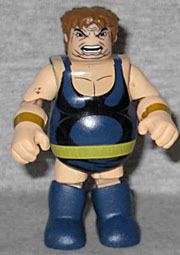 He's got Rufus' chest cap, big biceps and thighs, large rounded feet and puffy hands. His hair is parted down the center, and his face looks like Erik Cartman, with at least three chins. Paint continues to be an issue with this series. There's paint transfer on the biceps, and the gold stripes representing wristbands are crooked. The shadows on his stomach are nice, but there are none on the back, and the pink of his skin and the yellow of his belt aren't thick enough to keep the blue from darkening them - those are common issues, but the edges of the paint are really rough and uneven, beyond the usual. If you want a more retro-styled Blob, the set includes a second pair of hands without the gold stripes, and a pair of big bare feet. I guess the implication there was that he was too fat to reach his own feet? The color of the add-on pieces is a bit lighter than the body beneath (but the body is almost the same as the "wrong" color visible on his chest and neck, mixing things up even further). Series 60 had a gimmick where most of the sets came with extra pieces to allow you to change one X-Man into another - in this case, bonus parts turn Wolverine into the mutant inventor, Forge. There are two plain hands, of course, but those could work just as well for Logan as they do for... wait, is "Forge" his real name? Does Forge have a real name? Amazingly enough, if he has any name other than Forge, it's never been revealed. Weird. Anyway, he gets a new right leg with tech detailing on the thigh, a harness, and the same gun Hope had, which couldn't possibly be more perfect for him! Forge's skintone is just a bit darker than Wolverine's, and his hair is pulled into a ponytail. The only thing we'd add here would be a silver hand, and that's not strictly necessary.